With Terminus burning in the background, Rick and his ground press on in the wilderness. Rick checks in with Tara for a moment, letting her know that he trusts that she did not want to be on the Governor’s side. They pound fists and seem to let go of any potential anxiety. As for Carol and Tyreese, they chat briefly by the water about Rick and his decision with the actions at the prison. He says that he wants to tell people what happened to let them understand, but he chooses to leave out the death of the girls. Michonne spots a walker and takes a little pleasure in destroyed it. Watching her aggression, Abraham remembers why he chose to wait to tell the group about Washington. Later that evening, Carol and Rick chat about Terminus, while she reveals she recovered some items from the storeroom where they kept the confiscated goods. 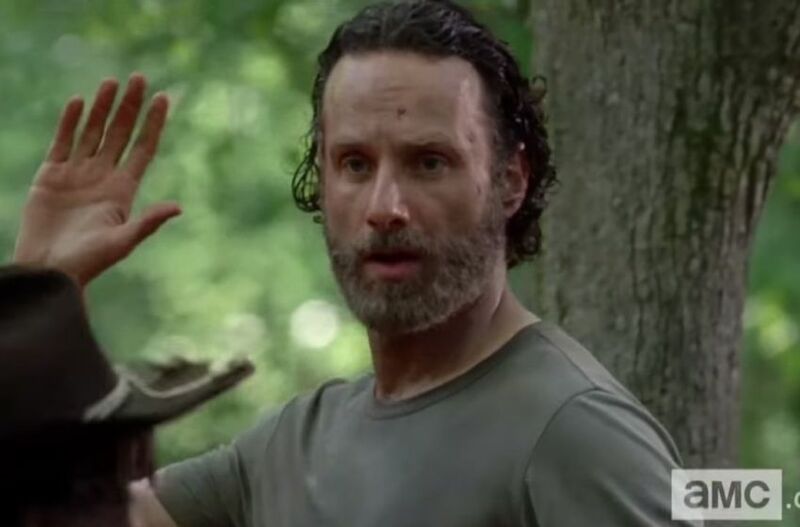 Rick tries to explain himself and offers to join her, acknowledging her leadership and survival skills. Now with Daryl, Carol refuses to open up. Hearing a noise in the woods, Daryl believes that they were hearing things, but there appears to be something watching them through the darkness. The next morning, Rick’s group catches Daryl coming back from a hunt, while he highlights that there may be someone watching. Abraham easily convinces Rick to start heading north and try to find a vehicle. Sasha and Bob seem to have reconnected as well, playing a little kissing game while on the hunt. Suddenly, screams in the distance cause Carl to get the group to head to help. A man is found stranded on a rock with walkers all around. The walkers go down easily and allow the man to come down from safety. After throwing up, he reveals himself to be Father Gabriel, having survived on his own. Asking for food, Carl gives him some pecans. Gabriel notices Rick’s daughter, but turns the attention to safety. Rick starts asking him the questions, to which Gabriel answers no to killing of any kind in the name of the Lord. Michonne redirects the conversation on going to the church. Gabriel starts to make some uncomfortable jokes about leading them into a trap, which slows the group temporarily. Reaching the church, Rick takes the keys and start a search party inside. Except for Gabriel, the church is vacant of people and only full of religious items and empty cans. Abraham and Michonne get in contest over fixing the bus out back and resting to gather supplies. 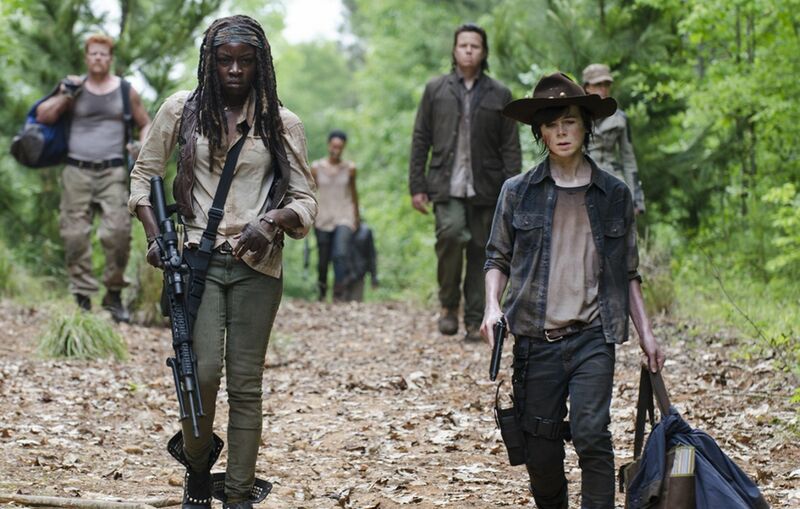 The group inevitably sticks with Rick’s decision. Gabriel admits to eating the food from a food drive until it ran out. He highlights that there is a place nearby but walkers have overrun it. Rick agrees to have him lead them to the place. Asking Carl about his ability to trust Gabriel, Carl replies that not everyone can be bad. Rick gives some words of wisdom, but Carl reminds him that they must remain the type of people that help others, help each other, and cannot hide. That evening, the group enjoys their meals following a brief toast by Abraham, highlighting their survival. Turning his attention quickly, he tries to make his plea. Challenging the group to think about finding a safer future, he gets Eugene to support his cause. Rick uses Judith’s cooing to serve as his support for the group to say yes to traveling to DC. Bob and Sasha share a quick kiss before he walks away and she takes a turn with Judith. Tara and Maggie have a moment, but Maggie shows her support for Tara’s past. Rick takes a moment with Gabriel to thank him for refuge but also challenges him to reveal himself or at least choose to not cross him. Back in the woods, Carol returns to the car but has to also take out a walker. Daryl finds her but then is distracted by a car that drives by looking like the one that took Beth. They go chasing after her. Meanwhile, Bob ends up back out in the woods and starts to cry just before getting attacked by a shadowy figure from behind. Fuzzy but coming into focus, Bob finds himself face to face with Gareth. Justifying his actions, Gareth begins to try to torture him. Claiming that he has to hunt to survive, he believes that he is doing what is just and required for their situation. Bob finally looks down and sees that he is missing a leg, with Gareth’s group eating it. Reaction: After an explosive premiere, this second episode was a bit more about regrouping and restarting with the bulk of the group back together. Predicted tensions were certainly addressed, though relatively quickly and simply at the start of the episode. There was virtually no extended tension between Rick and Tara, even though she was on the Governor’s side of the fence during the attack. Rick essentially excused her past choices due to where she was now and how she stayed with Glenn when he needed help. As for Carol, she has been highly dismissive about the past and about talking about potential issues. It appears that her survivalist skills have caught Rick’s attention in the positive way, but she has also continued to become colder and more withdrawn. Tyreese had a moment of reflection, but his greatest comment surrounded his attachment to Judith. As for the new storylines, Gabriel adds an element straight out of the comics. Alone and out of food, he relies on Rick’s group to get something more to survive on. Meanwhile, he continues to stay stuffy about his secrets, though they seem pretty obvious. The scratches on the back door seem to unveil that he refused to let people in during the start of the apocalypse. He talked about sinning every day, which is likely his shame and guilt for past actions. The church lady walker that spooked him was in the picture that he was looking at toward the end of the episode. If he was honest with Rick and the group, he would likely be forgiven, but his devotion to his faith is likely going to keep him bottled up for the short term. Bob is likely done. He clearly had a moment with Sasha, not showing any sort of fear or sadness until he snuck out of the church. During the fight in the food bank, he was attacked and originally appeared to be unscathed. His slinking off must seem to suggest that he was scratched or bitten and was likely going to sneak away for good or go kill himself. Instead, getting captured by Gareth left him without a leg but still alive enough to experience the horror of the group of cannibals. Gareth is clearly crazy, but it is possible that Bob’s situation might cause him to go completely nuts. It is unlikely that the group would be able to effectively continue on with Bob is whatever condition they eventually find him, especially if Gareth keeps taking limbs. Next episode seems to keep the focus on Gareth, Rick, Gabriel, and Bob’s fate. Showing now elements of Carol and Daryl or Beth, they may be getting a feature episode soon. Gareth will likely meet his ultimate end within this half of the season, but only time will tell if it will be as brutal as the comics.